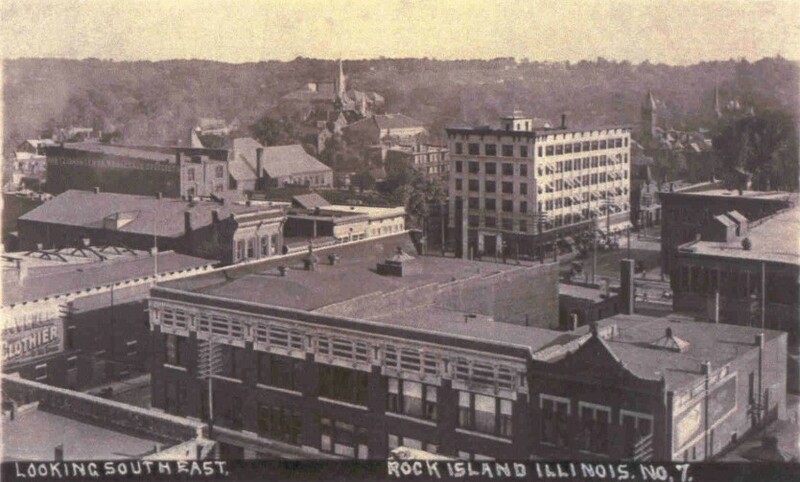 Once again, thanks are due to Shannon Hall for lending us a most intriguing Real Photo postcard of the buildings and rooftops of downtown Rock Island. The presence of certain buildings and the absence of others let us date this photograph to about 1909. The photographer was likely atop the roof of the brand new Best Building – now called the Plaza Office Building — on 17th Street and Second Avenue, as he pointed his camera to the southeast. Coal-fired smoke emanates from several chimneys and a haze overlays the scene, yet trees are fully leafed, perhaps indicating a chilly autumn day. The only building shown in its entirety is the six-story 1908 Safety Building. Otherwise we are treated to a view of rooftops and upper stories with few glimpses of street level. The horizontal line of the bluffs near the top of the scene is interrupted only by Suzanne Denkmann-Hauberg’s new house at the apex. Several church spires are visible, from left to right Immanuel Lutheran, First United Methodist, and Trinity Episcopal. We see the high school on 6th Avenue and 21st Street in the center distance, and houses are interspersed among the larger commercial and public buildings. Among the notable empty spaces in these blocks are the two banks that would soon be built across Third Avenue from the Safety Building. This series of postcards includes many of these buildings visible in this scene. Among them, from left to right, Lavelle Clothier at the far left; the old YMCA, whose pyramidal tower just peeks just above the large building with the painted “Hartz-Bahnsen”; the Public Library; the Safety Building; the Como Hotel; as well as the churches. Today we will focus on some of the buildings which do not have postcards of their own. Dominating the photo is the Robinson Building, now known as the Center Building, on Second Avenue at 18th Street. It dates from the 1870s, when Rock Island National Bank occupied the first floor and the Masonic Temple was upstairs. In 1909, this elegant façade, with intricate concrete geometric designs at the top edge, covered the original building walls as well as its neighbor to the right in a project that reportedly cost $60,000. The rooflines clearly distinguish between the two buildings and a close examination of the façade reveals the juncture as well. The July 2, 1909, edition of the Argus included many details about this historic building and showed a drawing of the remodeling. That drawing is signed by Temple, Burrows, & McLane Architects, and Burrows was quoted for the story. Henry Horst was the contractor and C. J. Larkin was the masonry subcontractor. Pictures of the building before and during construction appear in the Argus on July 10 and July 17. During the Robinson remodelling, wide “Chicago Style” windows, distinguished by a large fixed center pane flanked by movable sashes, were added. The name derives from their common use in the “new” Chicago skyscrapers, where steel framing permitted wider openings than did previous all-masonry construction. These Chicago windows are no longer in place, but have been replaced with various asymmetric window combinations. Most recently, windows at the far right have been restored to a design closer to the original. Immediately to the right of the Robinson Building, the third story and cornice of the 1892 Krell & Math building is visible. Today, that upper area is mostly intact, missing just the top triangular ornament that bore the building’s name and date. Krell & Math operated a bakery, confectionery, and ice cream shop here. The rear of the building was later expanded all the way to the alley. At the left of the photo, behind the Lavelle Clothier, is a building with a side-sloping roof hidden behind a high front parapet with an ornate cornice. This unusually tall three-story structure was built around 1876 as the warehouse of Henry Dart’s & Sons Wholesale Grocers, a firm founded in 1857. It was reported to have a “strong iron frame front.” Although the cornice is missing today and the storefront has been modified, the windows in the upper stories still have their graceful arches. Next to the Dart building, the cornice of another 1870s era building, believed to be the work of contractor Justin Taylor, is visible. The two-story building held two storefronts which have served many businesses over the years, from wholesale liquors and plumbing to candy manufacturing and retail sales. From early 1920s until the 1950s, signpainter Richard Carnes worked upstairs. His memory is evoked in the still legible advertisements he painted on the stair risers leading to the second floor. The exterior of this vintage building has been covered with newer buff-colored brick. Around 1910, the fourth building in the row was constructed so Gansert’s could expand into the upper stories, while Copp and Gadient’s Home Tea Store occupied the first floor. The candy company went out of business in the late 1920s. Although the building is still standing, its exterior was recently incorporated into the new façade of the WHBF building. Finally, notice the four-story, flat-roofed building across from the library and designed by the same architect, Leonard Drack. This is the Sala Apartments, known for a time as the Olmsted Apartments, built in 1903 by physician E. M. Sala to provide spacious, luxurious downtown living. A house just to the left of the apartments is still standing in this photo. It would be replaced in 1913, when an addition to the Sala gave it the size it has today. The Sala, which was listed on the National Register of Historic Places in the early 1980s, has been completely renovated. This article by Diane Oestreich is slightly modified from the original, which appeared in the Rock Island Argus and Moline Dispatch on October 19, 2003.